Although Zionist sentiment had been rising in Europe throughout the 19th century, the birth of the modern Zionist movement is considered to be the First Zionist Congress organized by Theodore Herzl in 1897 in Basel, Switzerland, out out which came the World Zionist Organization. In the U.S. the Federation of American Zionists (renamed the Zionist Organization of America in 1917) was founded in 1897 in NYC and expanded to cover the whole country the following year. Pre-existing Pittsburgh groups dating back to before Basel joined at that time, and subsequently additional groups were organized. Alas, after the Homestead group’s attendance at Zion Day in 1905, I didn’t see any more mentions of this group until the teens. The strange thing about the mentions of Zionist activity in Homestead starting in this decade is that each time a group is mentioned, it seems to be a re-start. 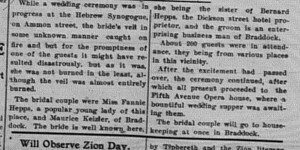 On 3/8/1910, The Jewish Criterion reported, “Allegheny, Braddock, Homestead, and Connellsville are the places where local societies will hereafter carry on Zionist work. The members of these new societies, it is reported, all appreciate the task before them and take up the same with great enthusiasm.” The next mention is possibly of their group attending a Zionist dance in 1911. And that is all for the time being. As a result of the efforts of Mr. 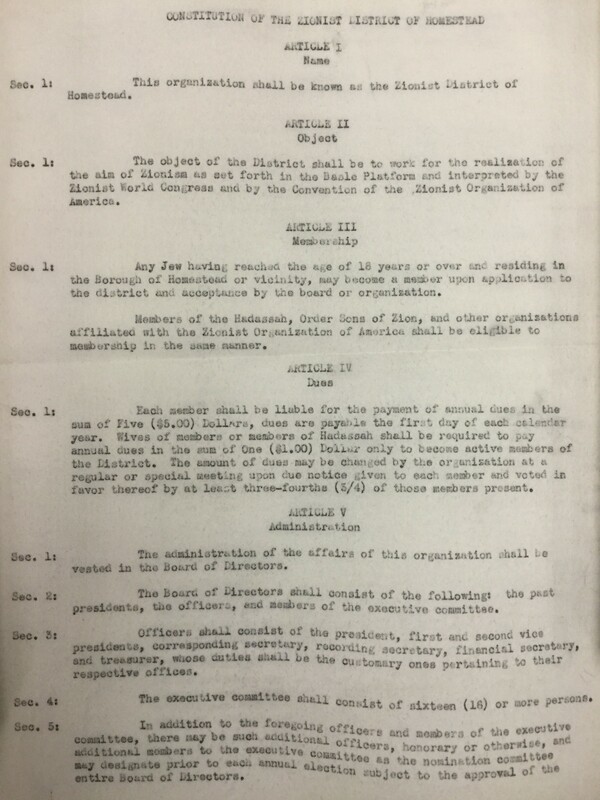 P.M. Raskin, who recently visited this district a Zionist Society has been organized in Homestead. The organization meeting was held at the home of Dr. and Mrs. David Reiter and the officers chosen to complete the organization work are as follows: Dr. David Reiter, president; Mrs. Herman L. Little, secretary; Mr. Joseph Lasdusky, treasurer and Dr. M.H. Moss, Mr. Morris Grinberg, Mrs. David Reiter and Mrs. Hyman Sapeer, membership committee. The next meeting will be held Monday night, December 27th, 1915, at the home of Mr. and Mrs. Herman L. Little. It’s possible that this group’s activities fell off as the greater urgency in the Jewish community was around helping “Jewish war sufferers” in Europe. About a later period, Allen Smooke reported about the Sapeers, the leading Zionist family in Homestead, “They were Zionists. Oh, that was a bad word. That was a bad word years ago. They were Zionists. That was almost like saying they were Communists… You were taking money away from the people in Europe that had the problems and sending it to Israel. You’re talking about back in the late ‘30s, early ‘40s. I’m talking from like ‘36 to maybe ‘41 or ‘42. I remember that family. That’s all they were interested in…They were doing the right thing all along, and nobody knew it.” It’s possible this attitude also prevailed during and after WWI (before Allen was born!). 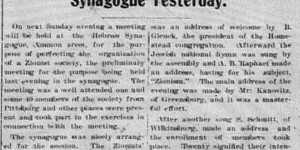 On 4/24/1919 and 7/20/1919 the Western Pennsylvania and Western Virginia Zionist conferences included a Homestead contingent amongst many other small towns’. Separately, the Jewish National Fund, founded in 1901 to buy and develop land in Palestine, had a presence in Homestead in the teens. The Jewish National Fund Commission of Homestead, recently organized by Dr. B. Epstein will hold a public meeting Sunday, evening, February 4th, in the Homestead Synagogue. Dr. H. M. Snitzer, president of the Zionist Council of Pittsburgh will speak on “The Jewish National Fund” and Mr. M. L. Avner, president of the local Jewish Congress Committee will speak on “The Jewish Congress.” There is no man better acquainted with all details to the coming Jewish Congress than Mr. Avner is, nor is there anything before the Jewish people of America at the present time of more importance than the Congress. No one who has the opportunity to become acquainted with this great institution should neglect it; and every one in Homestead and surroundings will have that opportunity Sunday evening, February, 4th. The Jewish National Fund Commission of Homestead cordially invites all to attend this meeting. If there were qualms at the beginning of the decade about diverting money to Israel that could help their brethren in Europe, those qualms had faded by the end of the decade in the face of rising violence in Palestine. Organized Arab attacks against Jewish settlers began in 1919 and escalated through the 1920s, with the 1929 riots in Jerusalem and massacre in Hebron getting particular attention. 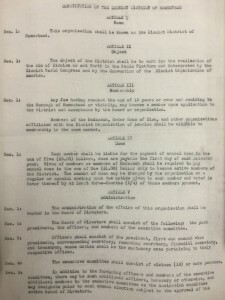 Apart from the activities of the Zionist group, which I detail below, the shul raised $355.50 in September 1929 “for the sufferers in Palestine, who are attacked by Arab rioters.” These current events, plus the growth of Zionist umbrella organizations, likely contributed to the growth of Zionist activities across America throughout this decade. Homestead’s attendance at regional Zionist conferences continued. I found references to their attendance at ones held on 12/3/1922, 3/9/1924, and 6/1/1924. (Probably there were others — OCR is finicky.) You’ll see the Sapeers continue to be involved on a local level and within Pittsburgh as well; when a new (?) 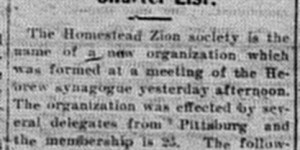 group, the Zionist Regional Union, was “permanently organized” in Pittsburgh on 11/25/1923, H. Sapeer joined its finance committee. …The Jewish Community of Homestead has resolved to put their city on the Keren Hayesod Map. Accordingly, a number of old-time Zionists got together with some of the influential Jews in Homestead and organized a Keren Hayesod Campaign, which will start early in January. Mr. A. C. Stein will address a public meeting at the Homestead Synagogue, Sunday evening, January Seventh. His subject will be “Palestine: What It Means for the Future of the Jews”. The Committee in charge of the Campaign are as follows: Chairman, Bernard J. Weis; Vice-Chairman, Mrs. A. L. Hepps, Mrs. Meyer I. Grinberg and Mr. B. Friedlander; Secretary, Miss Jean B. Friedlander; Treasurer, Mrs. Bert Kline; Executive Committee, Mr. Mark Fischel, Mrs. B. Friedlander, Mr. Henry Glick, Mrs. Enoch Greenstien, Miss Ruth Grinberg, Mr. Morris Grinberg, Mrs. I. Grossman, Mr. Leo Half, Mr. Barney Hepps, Mr. Joseph Katz, Mr. Hyman Koss, Mr. Samuel Margolis, Mr. Hyman Sapeer, Mrs. Hyman Sapeer, Mrs. Sam Sapeer, Mrs. H. S. Schwartz, Mr. Harry Solomon, Mr. M. D. Weis, Rev. Samuel Widow, and Mr. Joseph Wintner. At a public meeting last Sunday evening Mr. A. C. Stein, of Pittsburgh, made an eloquent plea for the Keren Hayesod. As a result $400 were pledged by those present, each pledge being accompanied by a substantial payment. Team No. 1, Mr. M. D. Weis and Mr. Harry Solomon; Team No. 2, Mr. , B. Friedlander and Rev. Samuel Widom; Team No. 3, Mr. Bemard J. Weis and Mr. Joseph Wintner ; Team No. 4, Mr. Mark Fischel and Joseph Katz; Team No. 5, Mr. Hyman Sapeer and Morris Greenberg (sic? Grinberg?). It is expected that the committees will be properly received and the Homestead Jews will respond generously to this great cause. Homestead, Pa.:—Under the auspices of the Zion District an entertainment and lecture will be given Sunday, March 30th, at 8:00 o’clock P. M., at the synagogue on Tenth Avenue. A very fine program has been arranged. Dr. H. J. Stern, Rabbi of the Temple Israel, of Uniontown, will be the speaker, and Miss Gertrude Lieberman, of Pittsburgh, will render several vocal selections. A group of Palestinian songs, in Hebrew, will be sung by the children of Mr. Meyer Resnick, of Palestine. Mr. Resnick himself will give his impressions of Palestine, where he and his family resided for years. Everyone is urged to attend, as the program will be entertaining as well as instructive. Mr. Louis Lipsky, Chairman of the National Executive Committee of the Zionist Organization of America, who has just returned from London, will be the principal speaker on Sunday evening, April 27th, at 8:15 o’clock, at the Zionist Institute. A piano solo, by Miss Sadie Weiss, of Homestead, Pa; Palestinian songs and dances by Clara, Esther and Mordecai Reznick, of Homestead, Pa. (formerly of Palestine). An orchestra composed of Peabody and Schenley students, will render several selections. A cordial invitation is extended the general public to be present. In July 2015 a friend from Beth Shalom, Bunny Morris (mother of pop artist Burton Morris), asked me to research the 8/31/1925 death of a Sarah Resnick buried in the Homestead shul. Sarah was the grandmother of Ralph Resnick, a friend she made during her last LA trip to visit her son. I was able to find Sarah’s death certificate (informant: Ben Stein) and her burial record from the chevra kadisha, but neither answered Ralph’s question why Sarah was buried in the Homestead cemetery. Then I forgot about the whole incident, thinking Sarah’s connection to Homestead was random, as apparently Sarah had only lived in the U.S. for a short time. Neighborly kindness is not something Chaya grew up with. Born in Vinograd, a small town in the Ukraine, Chaya says her classmates teased her for using a Hebrew name. She and her family survived three pogroms before running away to Romania. The Romanian border police refused her family entrance and they were jailed for five months. When release finally came, the family headed straight for Palestine. “My father was very Zionistic… How I love this country! How I love it!” Chaya says. However, Chaya’s mother had tuberculosis, so the family was forced to relocate to America. The book The Chicken Lady of Jerusalem says they went to Palestine in 1920. They came to Pittsburgh/Homestead c.1923 to join Sarah’s Stein family, who were already there. Sarah died 2.5 years after, Clara recalled. I found the previous two newspaper articles much later and was delighted to discover this family mentioned in such a way. Arleen, Ralph, and Iris are all related through these Steins; their Stein grandparents were siblings. Ralph’s aunt, Sarah’s daughter Clara, was a well-known and beloved tsodeket in Jerusalem.